Ash Carter is the Director of the Belfer Center for Science and International Affairs at Harvard Kennedy School. He is also an Innovation Fellow at MIT. For over 35 years, Secretary Carter has leveraged his experience in national security, technology, and innovation to defend the United States and make a better world. He has done so under presidents of both political parties as well as in the private sector. As Secretary of Defense from 2015 to 2017, Secretary Carter pushed the Pentagon to “think outside its five-sided box.” He changed the trajectory of the military campaign to deliver ISIS a lasting defeat, designed and executed the strategic pivot to the Asia-Pacific, established a new playbook for the US and NATO to confront Russia’s aggression, and launched a national cyber strategy. 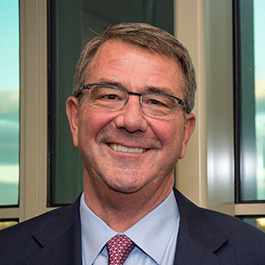 Secretary Carter also spearheaded revolutionary improvements to the Department of Defense, developing new technological capabilities, leading the “Force of the Future” initiative to transform the way the department recruits, trains, and retains quality people, opening all military positions to women, and building bridges to America’s technology community. He was also elected a Fellow of the American Academy of Arts and Sciences and is a board member of the Council on Foreign Relations and a member of the Aspen Strategy Group. Currently, Secretary Carter is member of Delta Airline’s Board and advises the MITRE Corporation and Lincoln Laboratories on technology matters. Secretary Carter earned a BA from Yale University and a PhD in theoretical physics from the University of Oxford as a Rhodes Scholar.